St Paul’s Institution (SPI) Seremban, stands proud to have been a nursery for hockey for decades and two former pupils who had played a key role in shaping the tradition are Lawrence van Huizen and William Fidelis. It may be long overdue but better late than never. But both Lawrence and William have always been remembered for their contribution, and were given a fitting tribute by the former Paulians with the “Home Coming" thyme last Saturday at the Seremban 2 hockey Stadium. The event organised by Michael Yen, a former national hockey player himself, was in honour and recognition of the dedicated, committed, beloved, strong willed coaches Lawrence and William. Also present to make the event possible was SPI principal Lucy Ratnam, senior assistant (co-curriculum) Shantini Lingam and Old Paulians Association president, Prof Ganakumaran Subramaniam. “These two "hockey icons" of St Pauls Institution have spent tireless hours and sweat on the pitches to produce respected hockey players and human beings. Some have moved on to represent the nation whilst others have moved on in life and become respected individuals and corporate figures,” said Terence Rajasingham a Paulian and ex-state player. Terence’s sentiments were echoed by 40-odd ex-Paulian hockey players who played a friendly match against with the present St Paul’s team before honouring Lawrence and William at halftime. The match ended with the younger Paulians winning 6-3. Among the ex-Paulians who were present included former national players Colin Sta Maria, Stephen van Huizen, Gary Fidelis, Derek Fidelis, Raymond Tio, William Lazaroo, Kevin Nunis, Michael and Ian Sta Maria while among the state players present were Stephen’s brothers John, Stanely and Adrian van Huizen, Anthony Chan, Lionel Wong, Peter Yan, Terence, Lim Loke Choy, Colin Fidelis, Surinder Singh, Lawrence Tan and M. Gobinathan and former national hurdler Kenny Martin whose first love was hockey. Of the national players SPI produced, Brian sta Maria, Stephen, Colin, Kevin, Gary Fidelis and S. Suriaghandi and Keevan Raj became Olympians. Stephen had the distinction of being involved in four Olympics, six Asian Games, three World Cups, two Commonwealth Games and four SEA Games as a player or coach. Before that Lawrence himself and late Peter Van Huizen, late Datuk Ho Koh Chye and Franco De Cruz had already set the ball rolling to play in the Olympics. Other top notch players who have emerged under the tutelage of Lawrence and William include the likes of James D’Cruz, M. Joseph, Peter Danker, Michael, Henry sta Maria, Yap Yook Cheang, Ch'ng Meng Kung, David Paul and Mark Paul to name a few. Then Negri Sembilan hockey then had three districts with their respective schools and coaches as power centres of hockey. While in Seremban there was SPI with Lawrence and William Fidelis, King George V (KGV) with the late Datuk Ho Koh Chye, whereas Kuala Pilah had Tunku Mahmud School (TMS) with Mithal and finally Tampin with Tunku Besar School (TBS), had the late V.Sivapathasundram churning out outstanding hockey players. “There were so many dedicated teachers and coaches with so much passion for the game those years and it was no surprise that so many talented players emerged,” said Kevin. Indeed Lawrence has given back so much to the game. The 1964 Olympian who turned 88 on July 30, represented Negri Sembilan from 1951-1968 in hockey, also played football for the State. In hockey, besides the Tokyo Olympics, he has also played in two Asian Games – the 1958 Tokyo and 1962 Jakarta Games. He was also the captain of the Pre-Olympic tour of India in 1964. 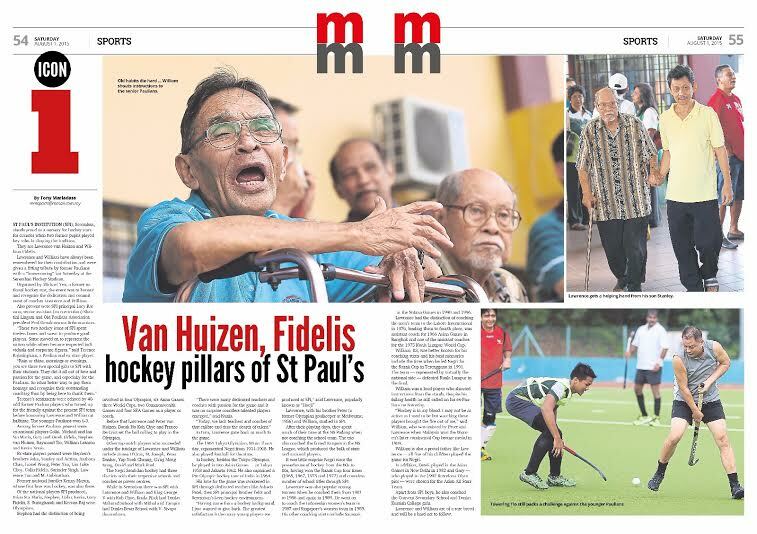 His love for the game was instilled in SPI through dedicated teachers like Ashwin Patel, then SPI principal Brother Felix and the hockey environment in Seremban. Lawrence, together with his late brother Peter (a former Olympian goalkeeper in 1956 and played in two Asian Games – 1958 and 1962) and William, who all studied in SPI, after their playing days spend most of their time at the NS Padang when not coaching the school team. The trio also coached the famed Rangers in the NS hockey league which produced the bulk of the state and national players for the country. It was little surprise that Negri Sembilan were then the powerhouse of hockey from the 60s to 80s having won the Razak Cup four times in 1965,1967,1975 and 1977 and countless number of schools titles through SPI. Lawrence was also popular among the ladies as he was the national coach 1981 to 1986 and in 1989 coached the Indonesia women’s team in 1987 and Singapore’s in 1989. His other coaching stints include coaching Sarawak for the Malaysia Games in 1990 and 1996. With men’s team, Lawrence has the distinction of the team in Lahore International Tournament 1976 steering them to fourth place, was assistant coach for 1966 Asian Games Bangkok and one of the assistant coaches for the 1975 World Cup. The 83 year old William on the other was better known for his coaching stints and among the fond memories he recalled included when he coached the Negri team in the Razak Cup tournament in Terengganu in 1991 when his team defeated Kuala Lumpur which was represented by 16 national players coached by Sri Shanmugnathan. William who was known for his loud voice and calls from the stand, despite his ailing health was still calling out at the ex-Paulians on Saturday. “Hockey is in my blood. I may not be as active as I used to be because of my health, but watching these players today, brought the hockey out of me,” said William who assisted Lawrence and Lawrence when Malaysia grabbed the bronze medal at the Women's Intercontinental Cup in 1989. William is also a proud father like Lawrence with his children - all five children played hockey for Negri. In addition, Derek played in the Asian Games in New Delhi in 1982 and Gary -- who played in the 1992 Barcelona Olympics -- was chosen for the Asian All Stars Team. Apart from SPI boys, he also coached the Convent Secondary School and Tunku Kursiah College girls. Indeed, Lawrence and William are rare breed and it will be hard act to follow by the present generation. Not only are they iconic personalities, but have made SPI stand tall for the sports of hockey.